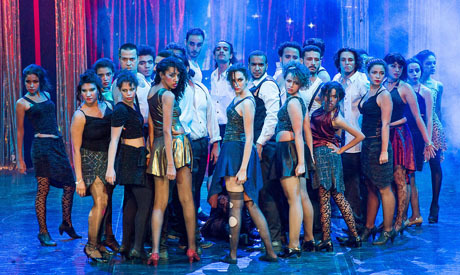 On 7 and 8 September, the Cairo Opera House Main Hall hosted a musical performance entitled Moulin Rouge. According to the programme notes and the show’s especially strong promotions, this is the world of Baz Luhrmann’s 2001 pastiche-jukebox musical Moulin Rouge! brought straight to Cairo’s audiences – spectacular. And indeed there were many indications of a link with the iconic film. The director, Rewan El-Ghaba used numerous songs from the musical, presented the same characters and restructured chosen elements of the plot. The female characters were dressed in costumes reminiscent of the courtesans and a giant illuminated heart surrounded the establishment’s large logo. At first sight all these components create a palpable connection with Moulin Rouge!, but as much as they do, the Cairo production painfully stripped the title of all the thematic, humane, historical, artistic, not to forget aesthetic factors characterising Luhrmann’s Academy Award-winning masterpiece. 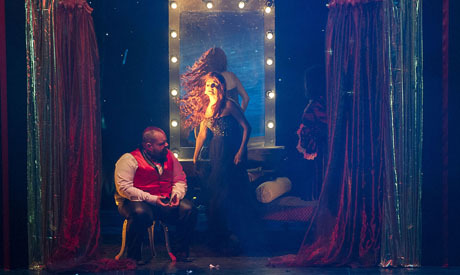 Performed fully in English, with recorded songs and short live dialogue on stage, the Cairo Opera’s Moulin Rouge immediately raises the question of who the target audience might be – unless, of course, this is the first step on the way to promoting the work internationally. In the hands of El-Ghaba, Moulin Rouge became a loud and visually provocative run through a number of scenes soaked in music, with the transitions keeping the audience in the dark for too long and rupturing any chance at artistic continuum. To give scenes a sense of dynamism, the lighting often involved dozens of white beams moving frantically across the stage to the rhythm of the songs. With the shallow performance relying on attracting – or rather numbing – the viewer on the visual and auditory levels, too many thematic and technical details sadly slipped through the young director’s fingers. Naturally, while El-Ghaba aimed at creating a compact show transforming the two-hour film into a short theatrical production, she had to make choices regarding how to present the core story. Her take reduces Moulin Rouge mainly to flashy visuals and courtesans that have nothing to do with the Belle Époque or all ideological and artistic contexts that surround it, which were well captured in the original film. Luhrmann’s work is a powerful depiction of the Parisian fin de siècle, of the Bohemian passions and conceptual revolutions that characterised France at the threshold of the 20th century, set in a powerful European gem attracting and embracing numerous poets, novelists and artists. The musical as presented by El-Ghaba, by contrast, is without depth, omitting the thought processes that explain the characters’ motivation. The characters include the famed cabaret star Satine (Mai El-Ghaba), the Moulin Rouge manager and co-founder Charles Zidler (Magdy El-Beheiry), the writer Christian (Eduard Cousin) and the Duke (Alaa Hour), but none of them rise to the level the film trained us to expect. The giant Moulin Rouge logo on stage is simply not enough to relate Cairo’s production to the human and social undertones poignantly captured in the 2001 movie. El-Ghaba’s Satine is simply a strong, sturdy and tragically unrefined courtesan who hopes to move from the cabaret to theatre stage. She neither projects any sensitivity or feminine fragility nor embraces the heartbreaking naivety of a character entrapped between the Bohemias’ obsessions and a lucrative business at the heart of Montmartre. Equally, El-Ghaba turned the dreamy Christian – himself tempted by the false optimism of the time – into a vaguely understood hero who, while trying to introduce the values of love to Satine, hopes to rescue her from an abusive employer. And when he is about to take her away from the grip of the Moulin Rouge, the healthy and strong Satine simply dies, which in the Cairo musical comes as an unjustified surprise. No need to delve into the many thematic simplifications that make the characters and the whole production artistically and ideologically shallow: the viewers found no sign of the relevant Parisian circles, or of people lost between refined art and spectacular cabaret, individuals in search of a utopian happiness, whether emotional or physical. In short, the iconic musical turned into a cold – if visually flashy – presentation of a nightclub that happens to have the name of Moulin Rouge. But such lack of contextual justification is only the beginning. In the film and in many theatrical productions of similar material, the artistic and aesthetic execution form the backbone of the work. After all, we cannot ignore that the famed Red Mill was never just a nightclub. It was always the epitome of the high-class courtesans and performers, a place for high-budget spectacles, classy enough to attract the wealthiest men of the time. It was also the birthplace of a new kind of “official” entertainment wrapped in cancan colours. Surely the Moulin Rouge as presented in Cairo, where the courtesans dress in visually offensive costumes, torn pantyhose, one-shoulder tank tops and unjustifiably exaggerated makeup, would have had no chance in the original setting. Speaking of which, there is a huge difference between the iconic cancan dresses or neat embroidery reminiscent of the Moulin Rouge and clothing that recalls the mannequins in the vitrines of the downtown Cairo’s lingerie shops. Along the same lines, the footwear, hairstyles and accessories had nothing to do with Europe in 1900. This basic betrayal of artistic values might have attracted a few additional viewers but at the same time it has completely cut off Cairo’s musical from the renowned cabaret it aimed to portray. Likewise the set design (by Mahmoud Sabry): it goes without saying that a show like this yearns for a big budget, but since the performance was produced by the director’s mother rather than a production entity, it had to make artistic sacrifices. Had El-Ghaba’s creative vision been aligned with the reality of the budget at her disposal, however, she could still have built a valuable – aesthetically appealing show. The well-known saying “sometimes less is more” could have come in handy. The problem with Cairo’s Moulin Rouge is not lack of budget but the lack of vision, distorted concepts and misguided choices. Even the smallest details – those should not stretch any budget – missed the basic artistic backbone. For example, a modern office chair moving across the stage on wheels became a completely random prop, out of the place and time that the show meant to present. Moreover, El-Ghaba decided to introduce an intimate small space – under the stairs stretching at the back of the stage – that represented Satine’s changing room. It is in this location that the protagonist encounters, one on one, Christian, Zidler or the Duke. The positioning of the small space where actors often had their back to the audience made it hard to follow the dialogues and the action. With so many basic artistic failures one keeps wondering how such production came to reach the Main Hall, widely regarded as Egypt’s most prestigious stage. According to El-Ghaba, the journey began at the Academy of Arts, in 2013, where a smaller version of Moulin Rouge was staged as part of her graduation project at the stage directing department. Now, with the help of Dr Nagat Abdel-Fattah, the producer and costume designer, she managed to reach the Ministry of Culture, which offered her the Opera’s Main Hall free of charge. The generous gesture aside, one still has questions regarding the assessment of the work which led to the ministerial decision. Still, it would not be fair to close this analysis on a negative note. Too much energy was invested in this production, too many passionate rather than professional actors, dancers and singers have put their name on it, becoming victims of all aforementioned flops. The biggest victims however were the choreographers, Sherin Hegazy and Hossam Abdel Hamid, who tried hard to link their work to the time and space that this musical represents. Even if their work introduced yet another chunk of simplifications, the research behind the dance steps and the effort to adapt them to the amateur performers’ capabilities is probably the only light in the show, dimmed by the general fiasco. The same goes for some good voices who participated, who could have been better utilised had they received proper musical direction. Two days of performance filled the Cairo Opera to the brim. The success in audience numbers – the only success of the show – is a predictable result of the name Moulin Rouge appearing on the banners and across the social media. The promotional campaign however lured the audience through false advertising techniques, convincing potential viewers of the originality of the musical and making a “First in Broadway-Style Show in Egypt” claim. But once the audience found itself in the hall, it was given a production that was not up to the standards that the Cairo Opera or the arts scene in general should maintain. Spectacular, Spectacular – as the Moulin Rouge! film reiterates – is not about flashy lights and loud music but about creative vision, understanding of the depth of the material at hand and how to direct it effectively.